Get a live Wraith to the bottom of the cavern - which is a heck of a long way down. Back in May 2012 when messing around with a Wraith in the cavern (the big underground area with a bridge), I realized I could get it to the bottom without the pilot dying. Normally he'd die part way down when the Wraith has got to a certain speed (I think that's the mechanism); but if you slow the Wraith by cushioning it with a Banshee at one or more points during the fall, the pilot can survive. There are various approaches you can take to doing the cushioning, but it's not terribly hard. It might take you a few tries or something, once you've had a bit of practice. Obviously you should get a handy checkpoint beforehand. Actually the descent work is a lot of fun in its own right, let alone any fun you may have at the bottom. With your checkpoint you'll be able to enjoy it again and again. Although any Wraith could be used, the one to go for is the Wraith on a plateau above the entrance of the tunnel leading to the cavern. With your Banshee (obtained from wherever), push it down to ground level then to the cavern. Once the Wraith is off its plateau, it doesn't try to move, and will only only rotate. As such, you can easily move it where you want. You can see some example footage in BCM274. Preferably get a handy checkpoint before the entire movement operation in case anything goes wrong. There's an obvious hazard of getting blown up, but if you stay close to the Wraith you'll find that it doesn't fire. 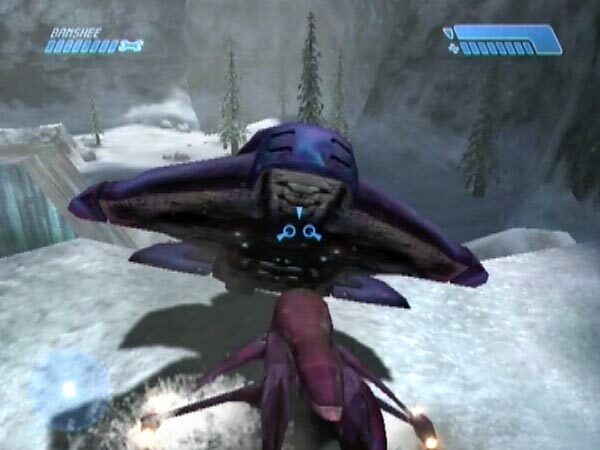 Another hazard is that the pilot might fall out when you're getting the Wraith down from the plateau. Bear in mind, he won't reboard. There's another Wraith in that same area, but it's very different because it constantly tries to return to its ice patch. You'd have a great deal of trouble getting it to the cavern, and once there it would still be trying to return. So it would be a very awkward subject indeed. In regard to technique for cushioning the Wraith down, that may partly depend on its initial position. In my first two movies BCM274 and BCM275 I had the Wraith quite a way from the edge, and shunted it off by barging into and under it. In the first movie, two descent tactics highlighted were (1) using freefall to overtake and get underneath when needed (and note: freefalling nose-down or nose-up is faster than freefalling level), and (2) trying to stay close underneath to make one or more cushioning touches, which is difficult. However, the second movie introduced a new strategy which seemed an improvement. Namely my 'early freefall method', in which you immediately freefall underneath to get clear before doing some cushioning. In BCM276 I instead had the Wraith teetering on the edge, in a couple of places. That obviously lets you easily knock the Wraith into the chasm, but I think the main benefit is that you can actually let the Wraith fall off by itself when it rotates to follow you. While it's doing that and slowly falling off, you have the option of freefalling to a suitable height to cushion the Wraith. It's essentially the early freefall method done in an easier way. As for what height is suitable, notice that the wall features a succession of light-coloured horizontal bands. 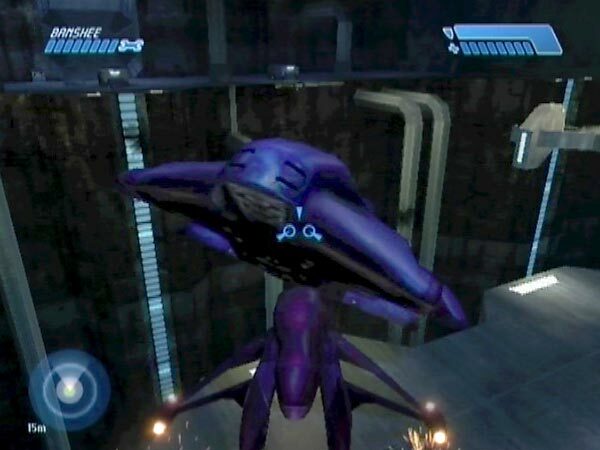 On PAL Xbox (things might differ on NTSC/PC) the pilot dies just past the fourth band if the Wraith is left to fall freely. Accordingly, I found a good height to be just above the fourth band. A single bounce at this height can get the pilot down alive. Try to avoid bouncing the Wraith into the wall though (or a pipe), else the pilot may get ejected. Regardless of cushioning strategy, one thing you might like to do for fun is attack the Wraith as it falls. Hitting it with a fuel rod shot is quite challenging but good fun. Note: if the Wraith happens to scuff against the wall or a pipe on the way down, that slows it considerably, which can obviously help, but there's a risk of pilot ejection, depending on the Wraith's angle. While working on BCM276 I realized there was another way of getting the Wraith down. Instead of slowing it with your Banshee, it can be slowed by friction with vertical surfaces. This became the subject of BCM277. The best plan here is to use a pipe. The vertical part of a pipe, that is. Start with the Wraith perched on the edge nearby (that's ideal I think), and shunt it towards the pipe in such a manner that the collision with the pipe is gentle, so the Wraith won't bounce off. 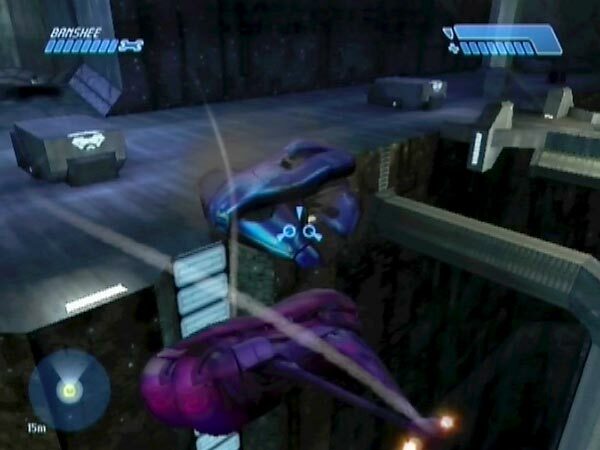 Depending on the angling, the Wraith can end up sliding down the pipe, slowed enough for pilot survival. Pipes seem remarkably grippy in fact. The chasm wall provides friction too, but isn't so amenable. I never obtained a descent via wall friction alone, but I did get a few descents where the Wraith bounced off a pipe (resulting in some initial slowing) then slid down the wall to reach the bottom successfully. Wall friction may be weaker than pipe friction, but I'm not sure about that. 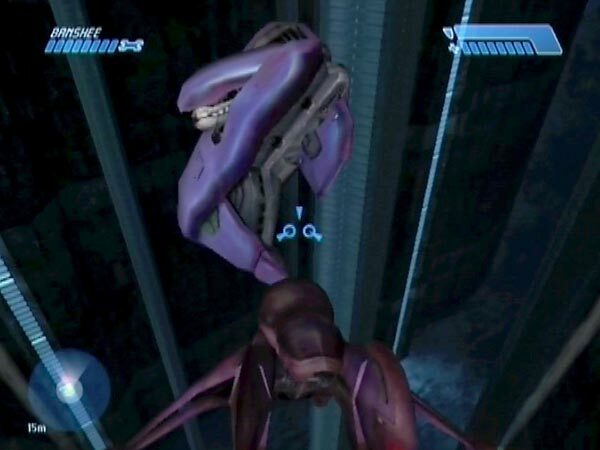 During the Wraith's descent, the pilot can eventually lose his shield (you can see a graphic effect for that; a bit of flashing) and give a grunt of pain. Normally he'd die almost immediately afterwards. But survival is possible if the Wraith is slowed soon enough. The Wraith is able to fire on the way down, and can even fire when upside-down! 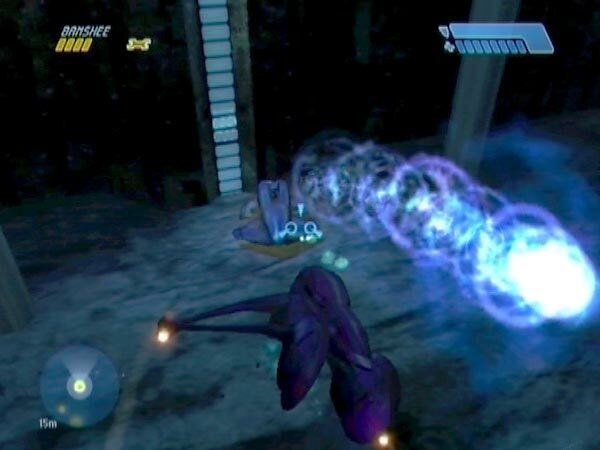 When falling fast enough, plasma balls actually go downwards rather than up, potentially beating the Wraith to the ground. When the Wraith is at the bottom, you can have some fun duelling with it (see pic, and my movies). It won't move around though, only rotate. 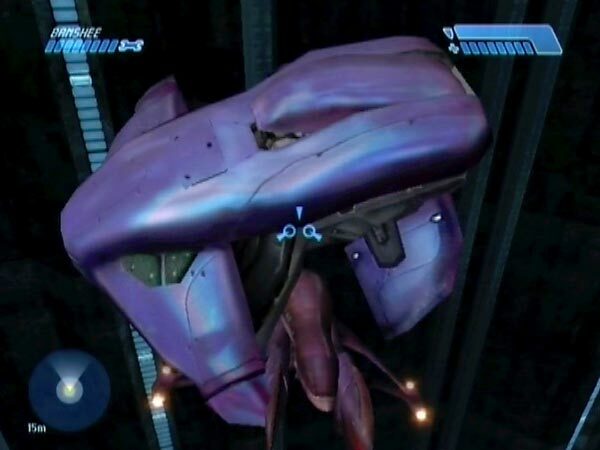 If the pilot is ejected at the bottom, either because the Wraith lands badly or because you flip it over later, he won't reboard if you right the Wraith. However, he's able to board a Ghost if there's one nearby. Just like with his Wraith however, he won't drive it around, only rotate it.